Echo was a very talkative nymph. She could chatter on for hours. Zeus decided to use this to his advantage. He used Echo to distract Hera, his jealous wife, so he could steal away with other nymphs. Hera was furious when she discovered that Echo was helping her husband with his infidelity. To punish Echo, Hera made it so that Echo could no longer start a conversation. She could not speak first, but had to be spoken to before she was able to say anything. Even then she could only repeat the words which the other person had said. One day, while out in the countryside, Echo spied a very handsome young man. 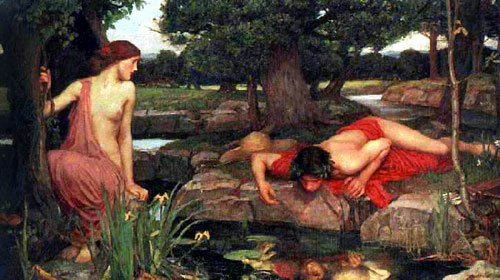 His name was Narcissus, son of Cephissus, a river god, and Liriope, a nymph. He was a very conceited young man, who had rejected the advances of many possible mates. Echo watched him from a distance, frustrated that she could not speak to him. After he had lost his hunting party, he called out, “Is anyone here?” Echo repeated back, “Here”. Narcissus yelled out, “Let us come together”. Echo replied, “Let us come together,” and rushed at him with open arms. Narcissus pushed Echo away stating that he would rather die than make love to her. Echo was so crushed that she withered away, not able to eat or sleep. Eventually, she turned to stone, and only her voice remains today, echoing... haunting the mountains. Narcissus later also died in a similar manner of an unreturned love. One of Narcissus’ rejected suitors prayed to the goddess Nemesis that Narcissus would feel the same pain of unrequited love. One day Narcissus stopped for water at a pool on Mount Helicon. He saw his reflection and fell in love with this beautiful man. Yet every time he reached for the image, it would disappear. He was so infatuated with the beauty of the image he could not pull himself away. He died of starvation staring into the pool. Today, all that remained of him is the beautiful and fragrant flower that now bears his name.